Featuring a convenient location near various points of interest in America´s Finest City, Four Points by Sheraton San Diego – SeaWorld is a comfortable hotel that is perfect for business and leisure travelers alike. Onsite features include a swimming pool, a fitness center and a restaurant that serves breakfast and dinner. Executives staying at this San Diego hotel can take advantage of the onsite business center and meeting room. Each of the cozy guestrooms offers a variety of convenient amenities, like a flat screen TV with cable service, a desk with an ergonomic chair and complimentary wireless Internet access. 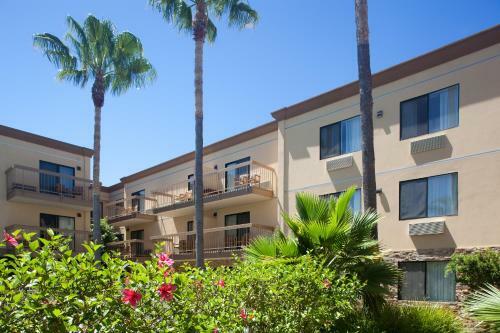 A hotel four miles away from SeaWorld and 4.5 miles from the airport, with a meeting room and a fitness center.